For a diamond necklace with quality diamonds in a brilliant setting, and at an affordable price, visit Anthony Louis Limited. We are a wholesale diamond jeweler serving customers in Tampa, Clearwater, Sarasota, and beyond. At Anthony Louis Ltd., we buy only the highest quality loose diamonds directly from the diamond cutters, so we’re able to sell these diamonds in gorgeous settings at prices that fit any budget. 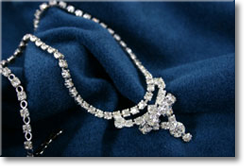 In addition to our unbelievable prices, we also offer customized designs for all our diamond jewelry. One of our designers will work with you to create a gorgeous diamond necklace that meets your unique vision, for a piece of jewelry that is truly one-of-a-kind. With more than 2 decades of experience in the diamond jewelry industry, we have the skills and resources to create a stunning diamond necklace that will exceed your expectations. We offer this same dedication to excellence when designing any piece of custom jewelry, from diamond engagement rings to diamond earrings. If you’re interested in our customized design service for a diamond necklace, engagement ring, or any other piece of jewelry, contact Anthony Louis Ltd. today to schedule an initial appointment. We’re happy to assist customers in Tampa, Clearwater, St Petersburg, and throughout Florida.